Hello! I've just finished this one in the nick of time for this week's installment of 50 States Stitching quilt project. 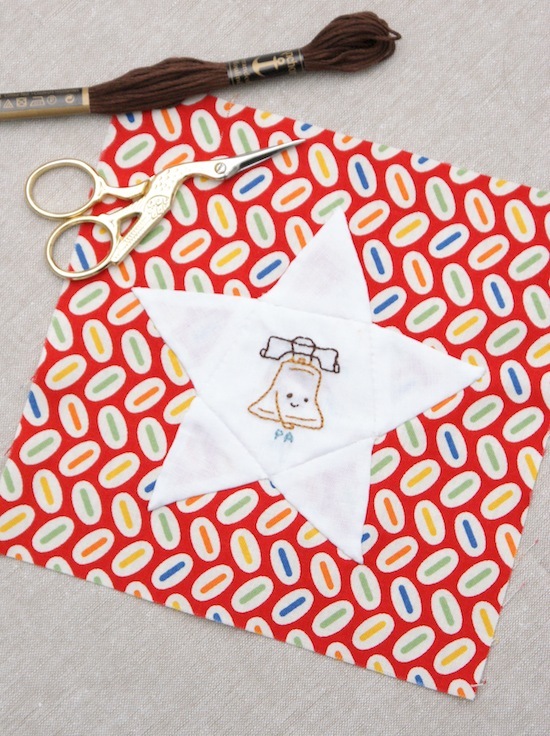 This week is Pennsylvania, so we've been given a fun Liberty Bell motif to stitch up. The great thing about this project (aside from making this great quilt) is learning something new each week, I find myself googling the design to find out more. I didn't realise the bell was cast at the Whitechapel Foundry in East London, but the clapper ball cracked the bell on it's first use!? eek! I wonder if the bell maker back in London got a telling off!? So cute and so many more weeks of fun to come! Great post! I'm working on a big EPP project right now but I have never tried glue basting.